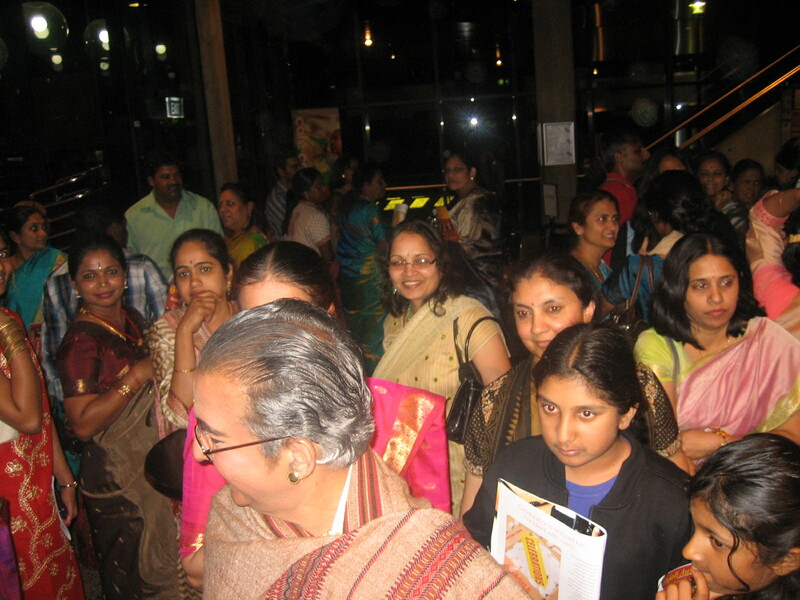 The packed hall at the Seymour Centre was sizzling with an excitement rarely found in other events in Sydney on 24 October 2009 as Natyanjali Australia made its fresh start truly establishing itself in the professional arena of dance with the Dhananjayans. Gayatri & Krishnamurthy and Aruna & Parthiban the coordinators for Natyanjali Australia slightly overwhelmed with the immense positive response stayed quietly in the background through the entire proceedings, for the stage this evening belonged to the master. The master whose modest and easy approach had already stolen the hearts of rasikas in the previous workshops held in Sydney. The event’s success only goes to prove that Sydney wants the best for itself and will support the best. For technicians the event was dressed with all nritta aspects in the dance of Gopukiran, Divya Seetha and Lavanya during the Nrittaswaravali and the Nrittaangahaaram choreographed by the Dhananjayans. The four enticing dancers executed their footwork in accurate and crisp energetic bursts in speed and pure dance through the evening. Some of the physically challenging poses were rendered with ease and comfort. It takes two to tango – two consisting of music and the dance. For not only were there master craftsmen on stage but every aspect of the production saw music sitting hand in glove with every emotive moment.What followed and stayed in the minds of the audience ofcourse was the ever green dance of the story of Nandanar a devotee of Shiva, prohibited from entering the temple for he was an untouchable, who through a pure miracle escapes the cruel landlord and finally merges with God himself. Assisted comprehensively by the cruel landlord danced by Gopukiran, the Nandanar Charithram is an old favourite of Dhananjayans which I believe saw the master’s rise to fame and recognition in India. Dhananjayan’s complete surrender to the role of Nandanar was evident for its compelling story telling through all the sanchari bhavas. 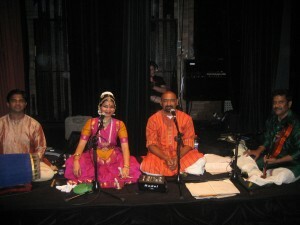 The master was at play as the music played “Poi Varaga” and “Thillai Ambalam” in a ragamalika and a talamalika. There is nothing more enticing than a voice that dances and a dance that sings. The combination of the Dhananjayans and the music of K.Sasidharan with the stalwart accompaniment of Kalairasan Ramanathan on Violin and KP Ramesh Babu on Mridangam was nothing short of perfect. Technique brilliance and creative action blended as the focus moved from the musicians and the dancers to the sad story of underprivileged and mistreated Nandanaar. During the short intermission, as many wiped their tears and walked out into the foyer this experience of Nandanaar Charithram was beautiful, for those who had seen Dhananjayan’s performance of this piece before, the wait for something new continued. The second half saw Shanta Dhananjayan come into play as Radha with Madhava as Dhananjayan. The mood from sad turned to mirth and anger as the tensions between Radha and Madhava grew. This age defying act cast its spell as both dancers brilliantly executed their respective roles set to Gita Govindam. The poet Jayadeva’s script fitted the actions and vice versa. The choreography and Dhananjayan’s fresh approach to a much beated about theme was refreshing. Finally, Dhananjayan as Madhava having consoled and won Radha move towards exiting the stage, as the curtains wait to be dropped, Madhava looks over his shoulder and with a single nod of his head that says “GOTCHA!” leaves the audience in peels of laughter. ‘After performing the Nandanar Charitram on the laps of the river Ganga at Benaras, on Shivaratri I was walking back to my room close to midnight when a street urchin came running behind me calling out, Babuji, babuji, thinking he was asking for alms I wondered whether I should stop or proceed when the urchin asked to speak to me . I stopped and he said…Babuji aaj thum muje Allah dika diya ( Sir you have shown me the almighty today). These words from a street urchin are the greatest award of merit I have received commending my dancing in all these years’ said Shri VP Dhananjayan. In step with tradition but ahead of their times, this is how the Dhananjayans have been described by both connoisseurs of the artform and laymen. Legends in the field of Bharathanatyam “The dancing couple” have partnered each other both through the journey of life and their journey through dancing. What comes through when one is in their presence is their sincerity towards the artform and their willingness to learn even after reaching a stage in life when they are considered as maestros of the artform. “Teaching is the best way to learn something. Our children Sanjay and Satyajit are our worst critics and also our students whose opinion we ask for when we present an item. We value what they have to say and if one of them choreographed and asked us to perform an item we would do so willingly. Such is their humility and their dedication to the art”. “I have often been scolded by some of my junior students for being mean to Shantha akka” Shri Dhananjayan says laughing, after they have watched us play Krishna and Radha together. They adorn the character they portray with such realism that one often finds it difficult to distinguish between the individual and the character they are presenting. Shri Dhananjayan’s entry into the dancing arena was by accident, and Smt. Shantha’s entry was planned by her parents who noticed an innate spark of talent in the child. But both of them in their unassuming manner say that they never realised that dancing would become such an integral part of their lives. They took one step at a time and created a revolution in the dancing world. “Solo male dancers were not popular and their role was more as part of a dance drama” says Shri Dhananjayan . People were bored of the usual Alarippu, jathiswaram format and they needed something different that they could relate to and enjoy. 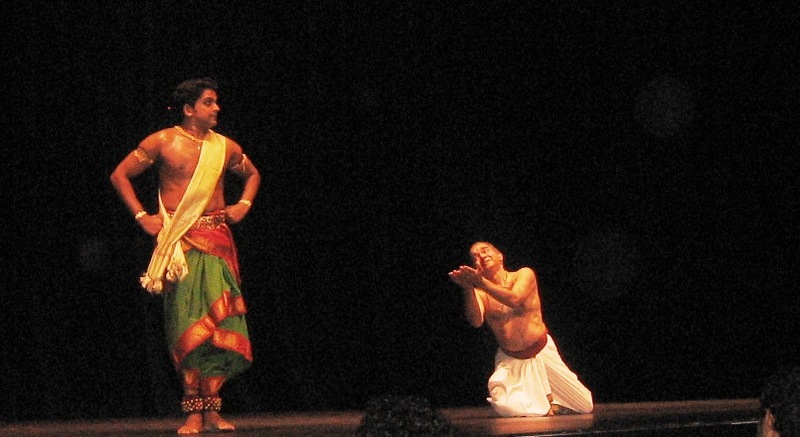 It took a lot of effort from our part to present Bharathanatyam in a new light, items with social themes, themes of nature were introduced to make it real to the audience without compromising on technique. In this context their association with the Ohio State Ballet to produce Rudyard Kipling’s masterpiece The Jungle Book is noteworthy. “East is East and west is west and never the twain shall meet” said Rudyard Kipling but I proved him wrong with this collaborative work presenting his (Kipling’s) own work The Jungle Book, Dhananjayan says with pride. Bharathanatyam is a like a big Banyan tree, there is the main trunk of tradition and many branches spreading all over and establishing roots in many different parts of the world but still attached to the main body of tradition, This is definitely the truth of the life of the Dhananjayans, they have not only dedicated their lives to the artform but also fostered many talents and let them flourish in different parts of the world.